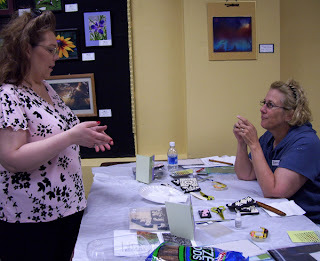 Everyone seemed to really enjoy the class and the cards they made. A lot of ladies said they probably never would have bought this stamp set (some because it is foam and others because they wouldn't have known what to do with it) but after taking the class they were inspired and very excited to go home and play around with the set to see what they could come up with. Hope you enjoy the cards! A Perfect Blend and Some Blog Candy! The Wizard and the Cuttlebug, I don't think you could ask for a better match! They blend together so wonderfully! The best part is, the Wizard is the only tool I need to get the job done!! I personally think that is one of the best selling points about the Wizard, you can use almost any die, embossing plate or folder and brass templates that is out on the market in this one machine!! How Great is that!? I don't know too many people who can afford to go buy a die cutting machine every time the newest one hits the shelves. Here are a couple of cards that a friend of mine ordered. 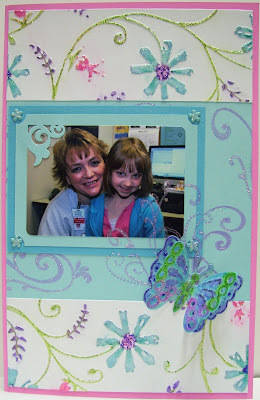 She wanted to have some really special Thank You cards for her daughters teacher and school nurse. I used the Wizard and the Cuttlebug together on both of these cards. On this 1st card the flowers are done with the Wizard. I love that die! It is called Flower Creations and it is so fun to work with. The die has six flowers and three flower centers. So many possibilities! 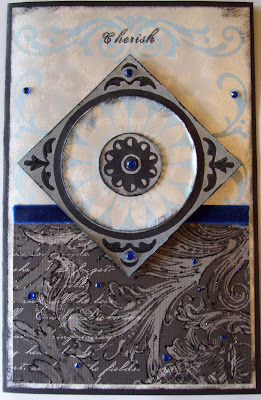 The white embossed paper behind the picture was done using the Textile Embossing Folder by Cuttlebug. The embossing looks like lace. To create this card I pulled all of my inspiration from the picture. 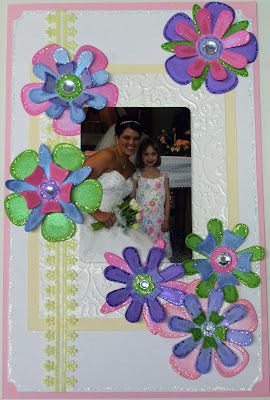 The flowers to match the little girls dress and the embossed piece to match the lace in the wedding dress. I also added just a touch of pale yellow for the bouquet of tulips. On this 2nd card I pulled all of my inspiration from the colors in the picture. 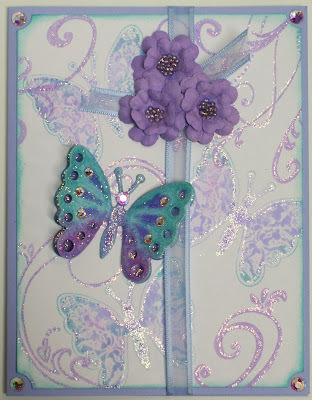 I used the Wizard Butterflies die and matching Impressabilities Butterflies stamp set to make the double butterfly. The die has two butterfly shapes and there are four butterfly stamps in the set. The paper with the embossed flowers was done with the Cuttlebug. 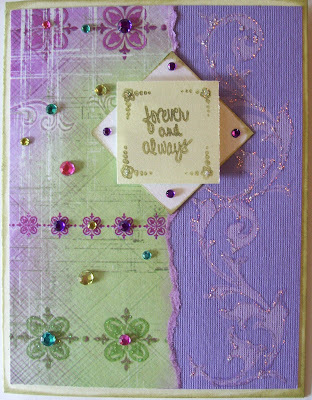 I used the Stylized Flowers embossing folder. Can you believe that started out as just white paper!! So what do you think? Is it the perfect blend? Let me know what you think and you just might win some Blog Candy! Post a comment on here and I will put your name in a drawing, post on your blog telling your friends about the blog candy and I will add your name five more times!! If you make a post on your blog let me know so I can check it out and then I will add your name five more times. 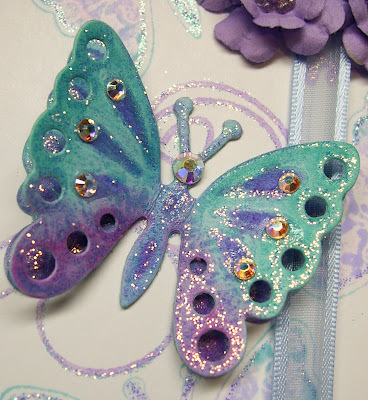 The Blog Candy will be a box filled with Wizard die cuts (flowers, butterflies and bugs, tags, cameos and broach, ladies fashion buckles) and from the Cuttlebug several pieces of embossed card stock. I am also going to put in some ribbon and some fun embellishments. I will keep the drawing open until Sunday July 1st and then I will draw a Lucky Winner and announce it Monday July 2nd. Thanks for posting! Have fun and Good Luck!! WOW!! Thank you so very much for all of the great comments!! I just wanted to add one more note--If you post a comment and you don't have a blog or if you don't want to post your email that is understandable but please check back on Monday July 2nd for the winner. I just don't want someone to win and then not be able to get a hold of them. Thanks so much!! I have been published!! I sent in some card samples a few months back and then about two months ago I received a postcard in the mail that said keep watching our magazine you’ll soon see your submission on our pages. So I have been waiting to see what was picked! I am so excited I received a complimentary issue in the mail. My card was published in the July/August issue of The Rubber Stamper. The submission call was for Alcohol Inks and I sent in three cards and a set of four dominoes. 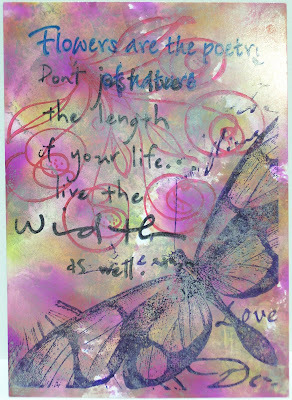 The card that was chosen has Alcohol Inks done on mirror paper. If you get The Rubber Stamper magazine check out page 44 at the top. My card is the butterfly one. Yesterday I got more news to add to my excitement!! I received a package in the mail from The Rubber Stamper magazine and they were returning my cards. As I was looking through everything I realized that one of my cards was not enclosed in the package. There was a letter that stated if your items are returned and you do not find all of your submissions enclosed, we are considering them for future publication!! Woo-hoo!! I’m keeping my fingers crossed!! Thanks to all of you so much who encouraged me to submit my design work!! This past week has been a really hard one for our family. 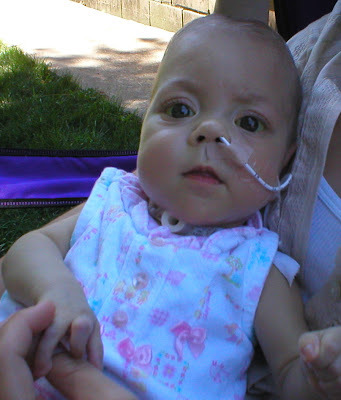 As some of you may already know my Cousin Lana’s little girl, Alexandria Mae, pasted away last weekend. She was only 19 months old. This was a post that her Mom and Dad and Big Brother Chance had on her (Alex’s) Caring Bridge website. For those who have not already heard. God has taken our beautiful ^Alexandria^ to be with him early Saturday morning. This was quite a surprise for all of us, since we thought she was doing so well. We feel Alexandria's little body just wouldn't let her do all the things that her big heart wanted to do. It is our hope that she went peacefully and that she will always remember all of those that love her. 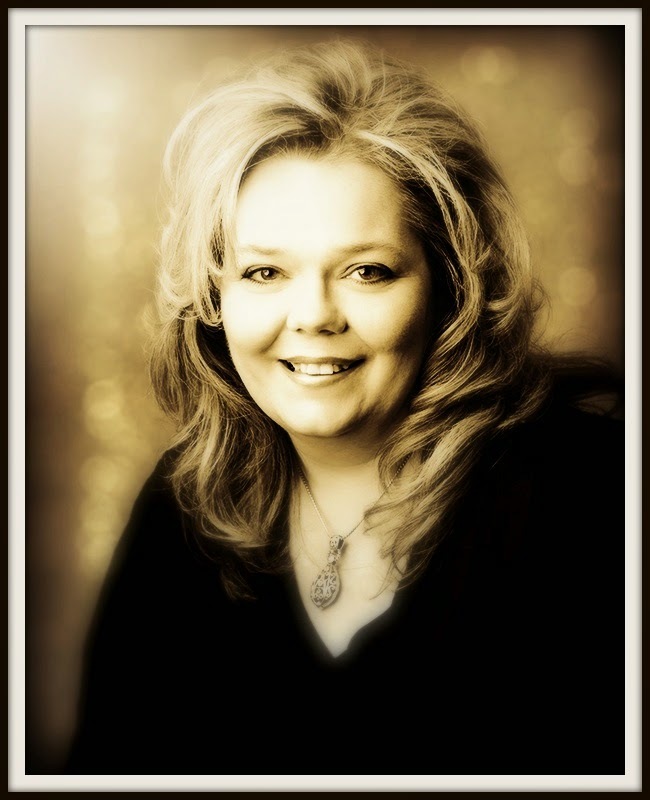 She will be so greatly missed. Through all of our grief, there are so many questions. Why? Why now? We know in our hearts that she had a greater purpose than we will ever know, and we are better to have known her. We are better for the time that we had with her, even as brief as it was. We have to believe that she is running, laughing, and doing all of the things that she just couldn't do here on earth. We have to believe that she is happy. Thank you to all of you who have put Alexandria in your hearts and prayers. I also wanted to say thank you to so many of you that I know have kept Alex and her Mom and Dad in your prayers over the last year and a half and also now during this time. Your prayers are very deeply appreciated!! On Sunday my aunt Becky called to see if I could do something for them. 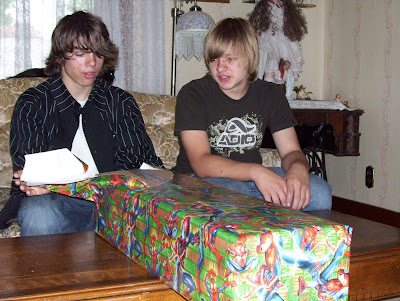 I had no idea what it was going to be, but I was willing to do anything I could to try and help out. She asked me if I could paint something for Lana and Swanny. 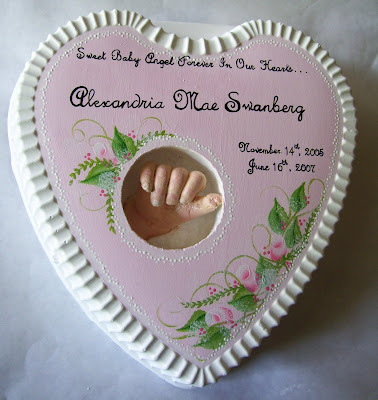 One of the times when Alex was in the hospital the nurses had made a three dimensional heart shaped mold and in the center was a mold of Alex’s little hand. My heart just sank. I felt very honored but so heartbroken at the same time. All that she asked is if it could be something pretty and in pink. The first night I just couldn’t bring myself to do it, I just looked at her precious little hand and cried. By Monday night I was able to focus a little better and sketched something out. I wanted it to be prefect! I painted into the late night and early the next morning I was able to finish it up. It turned out so beautiful and was placed on a table with several pictures of Alexandria. I painted four rosebuds to symbolize their family - Alexandria, Lana, Swanny & Chance. It's another busy week around here! 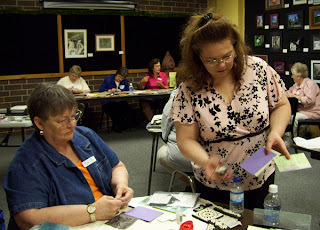 I had stamping class last night and I hope to get a chance (very soon) to post pictures of the cards we made. We had a lot of fun doing the different techniques and the ladies had another chance to use the Wizard Die Cutting Machine. We were busy making pretty butterflies. Today it has been a HOT one! But at least it is still cooling down at night. Went to the Stamp Studio today and took my samples in for the upcoming class. I am so happy the class is full and I am getting very excited!! I have had some phone calls and emails from some of the local ladies letting me know they are taking the class and they can't wait to see what we will be making. I also started cutting paper today for the big weekend project! Our oldest is going on a mission trip this summer and we are doing a fun raiser that I am in charge of. Myself along with the teens from the youth group, some of the parents and a few other adults that will be going on the mission trip will be busy stamping away this weekend. We are going to be making packs of greeting cards and stationary kits for the fund raiser, 400 cards (crazy I know! lol!!) and 80 packs of stationary. I hope and pray we can get it all done!! Wish us Luck!! Tomorrow my BF is going to be coming here for the weekend!!! I am soooooooooo excited to see her!!! She lives about 6 hours away so we don't get to see each other very often. Let's see what else is going on, oh yeah we are having a BBQ this weekend here at our house and then also at my uncles on Father's Day. My Friend Dana is back home from her trip to China and I can't wait to here all about it!! Welcome Home Dana!!! Sure have missed you!! 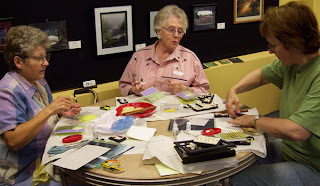 In my spare time I will be getting everything ready for the class at the Stamp Studio. Well I think that about covers all the goings on here--gotta run for now! I'll be posting some pictures really soon. Well I have to say this is a new experience for me. Yes I know you're thinking where have I been? LOL! Believe it or not up until not too long ago I had never made an ATC! *gasp* I know a few people that make them and I have even received some really awesome ATC's from some of my online friends. Not too long ago I was at the LSS and Karen (owner) told me that they were starting up an ATC Club and was wondering if I would like to join. She also said that some of the local artists from the Art Center were going to be joining the club too. So I thought what the heck this would be a great way to get into doing them and with so many talented local people how could I go wrong!! I was right!! I have been having a lot of fun doing the ATC's!! 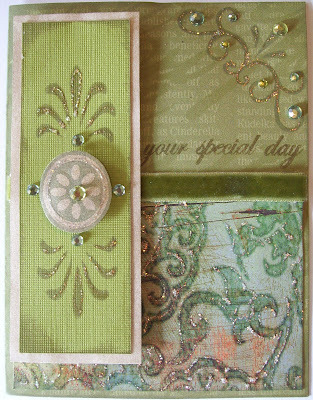 I love to see how many different techniques and embellishments and mediums can be put onto such a tiny little card. What a fun challenge!! 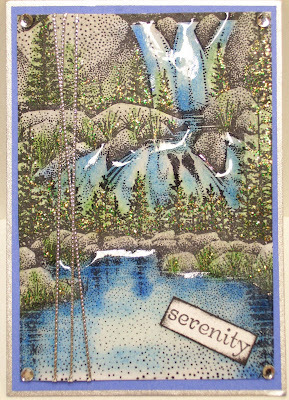 Here is my very 1st ATC!! I loved getting my little envy filled with so many wonderful ATC's!! This is going to be a great way to get a collection going!! 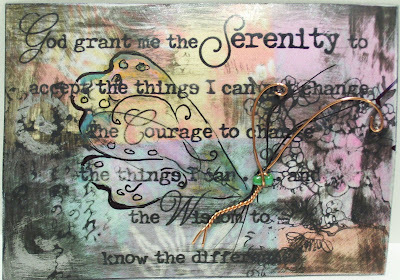 Each month we have a theme and for the month of May is was Serenity. It is so exciting to see all of the different and unique styles of design. When I first seen these I thought --Oh I have to post them to my blog and share them with all of my online friends!! So I sent out emails and asked if it would be okay to post. Here are the ATC's from some of the ladies in the club. So what do you think? I think they all turned out sooooo wonderful!! I can't wait to see what everyone is doing for June! Our theme for June is Flowers. Yummy Yummy Goodies in the Mail!!! I have a Wizard (by Spellbinders) die cut machine that I just absolutely love!! I've had it for about two years now and not only does it do the die cuts but it also embosses and has the most incredible detail. If you have not ever heard of or seen the Wizard I strongly urge you to check out the Website!! Just click on the word Wizard above and it will take you right to the Spellbinders website. 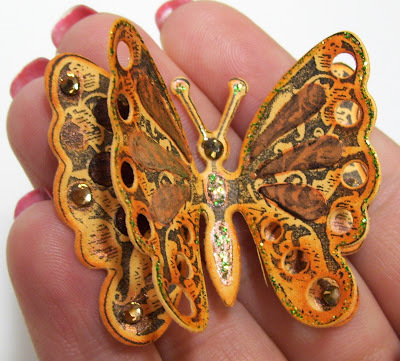 They not only have a large variety of amazing dies but they also have a New Rubber Stamp line, called Impressibilities that matches some of the die cuts!! How awesome is that!!! 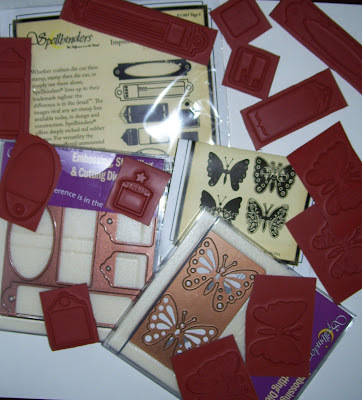 Now you can not only die cut and emboss but you can also add the rubber stamping for the finishing touch. Also if you visit there site you have to check out the video, you will learn all of the great things you can do with the Wizard. Ok so back to the package---I had a question about one of the products so I called them up one day and a man named Michael answered the phone and he was so nice and we talked for a little bit and I told him that I had done a demo using the Wizard at a Scrap'n and Stamp'n Retreat that I had been to in January. Well to make a long story short he said that I should talk to Stacey!! My 1st thought was OMGosh Stacey Caron!!! WOW I would love to talk to her!!! I have to tell you we have talked a few times and she is the sweetest person, so nice and friendly. I'm sure the 1st time we talked she must have thought I was a rambling nut! LOL!! I was so nervous at first I'm sure I was just talking silly! *wink* But she is so down to earth and so easy to talk to. Well I ended up getting a package in the mail from her!!! She said she wanted to thank me for the demo that I had done and thought I would like to try out some of the newest product.!!! Like I said Yummy Goodies in the mail!!! So here is a picture of what was in my package---I should have taken a picture before I started cutting the sheets of rubber but I was so excited I forgot!! The great thing about these stamps is that they come in a sheet of rubber and then you can either mount them to a wooden block or you can use easy mount so they can be used with the acrylic blocks. I also took a picture of the die so you could see just how thin they are. They come in a jewel CD case and you can store them that way or you could take them out and store in whatever way works best for you. 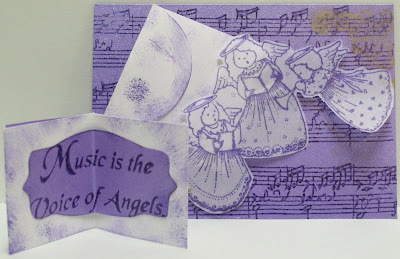 Here is my 1st card I have made using my new die and stamps. For those of you that know me I think you would agree that this couldn't have been a better set for me, I love butterflies!! I am also working on some cards with the tag die but I don't have them finished yet. I took a few close up pictures so you could see all of the wonderful detail. I added some Diamond Stickles (Ranger) and Swarovski Crystals (gotta have a little bling! )just to give it the finishing touch--I Love how it sparkles!! 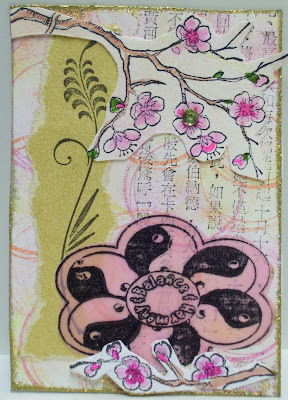 Also the swirl stamps used on this card are from Autumn Leaves. We have had so many things going on here and I can't wait to tell you all about the latest! I just might have to break this down into a few posts. So I am going to go back a little over a week ago and then work my way up to the current stuff. 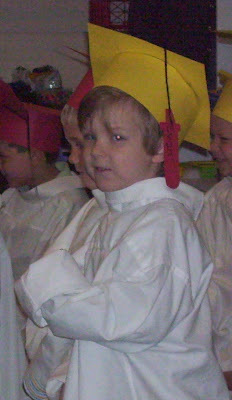 My first bit of news is that Evan graduated from preschool!! We are so proud of him and he was so excited!! They put on the cutest program for all of the parents and they had a little stand to get up on and receive their diploma. All of the kids were asked to bring a white mens dress shirt with them the day of graduation and then they put them on backwards, buttoned then up and rolled up the sleeves and that was their graduation gown, they all looked so cute!! They also made little caps for all of the kids and each one of the kids had a scrapbook that was all about them and what they had done through out the year. 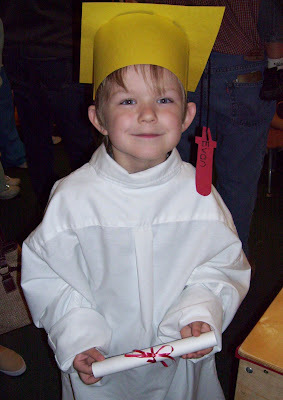 Now Evan is very excited about going to Kindergarten and keeps asking when he gets to start! Our oldest turned 14!! Wow I can't believe it, where has the time gone!! He really lucked out, for his birthday he had a really long weekend!! They had a teachers workshop and so there was no school on Friday and Monday. On Friday night he had one of his friends stay overnight, they hung out at the skate park, played video games and chowed down on the snacks. Then on Saturday he had some friends come over and they went to the new Pirates of the Caribbean movie, came back here and hung out playing video games and we grilled out and had cake and ice cream. 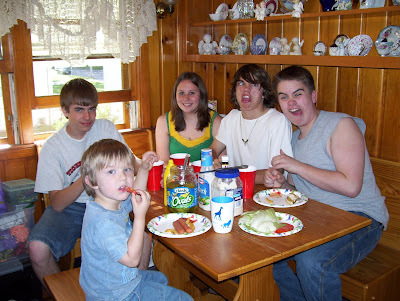 Later that night after the kids had all went home then my Mom and Dad came over for cake and ice cream. 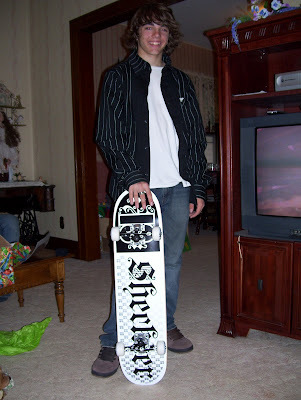 Dusty was happy with his big BDay present, he got a new skate board, a Sheckler one! His nickname that his friends have given him is Sheckler. He loves Ryan Sheckler who is a pro skateboarder and Dusty also looks somewhat like him. Crazy Teenagers! LOL!! 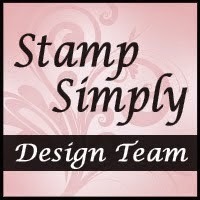 I also have some really exciting things to share with all of you as far as stamping goes but I am going to put that in the next post. 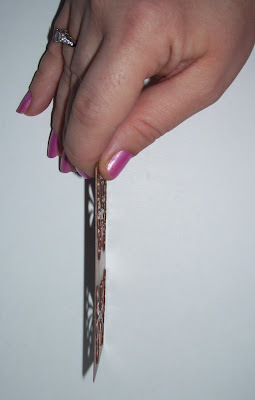 I will say this I got a really, really sweet package in that mail with some wonderful stamping goodies in it!!! Can't wait to share all about it with you! !